Don’t you, every day, type some words on the screen and share them with your friends, colleagues, and/or clients? A friendly reminder: Your writing is often the primary basis upon which your work and your intellect will be judged. What’s more, your writing can be a vehicle for progress. Today, most of our writing happens via email. This is why I’m excited to share with you an interview with a person who’s really good at it, Brandon Bruce, author & co-founder of cirriusinsight.com. Jenan: Every business and organization depends on words with impact. 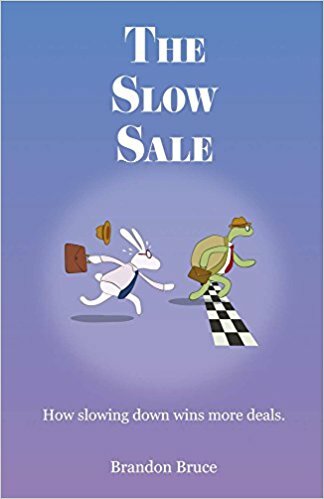 Because email = reach, in your book ‘The Slow Sale: How Slowing Down Wins More Deals,’ among other things you give the reader some practical tips on how to connect with people via email. Can you suggest some simple ways for entrepreneurs to poke holes in the design of their emails in an attempt to make them more impactful? Brandon: Here are few ideas/tips. Strip out all images and use plain text. Suggest non-traditional times to meet like 8:07am. Suggest a non-traditional meeting length like 17 minutes. Use one call to action link in the body of the email. Add a P.S. to the email and restate the call to action using slightly different words. Send a small no-obligation free gift – either via email (and track whether it’s accepted) or request a mailing address and ship the gift and follow up to confirm receipt. Use tasteful humor – everybody wants to be entertained. Send an invitation to an event – a unique experience with a defined date/time/location. Send a variation of the email via LinkedIn – it’s often less cluttered than the recipient’s inbox. Record a video for the recipient that is preferably short, funny, and personalized – something that makes them laugh and that they’ll share with friends/colleagues. Send an email with a small mistake in it and quickly reply to the email to correct the error to show humanity and personality. Email a friend instead and ask them to forward the message as an introduction to the prospect. Jenan: Thank you, Brandon, and all the best until next time! p.s. You can get your own copy of Brandon’s book on Amazon.